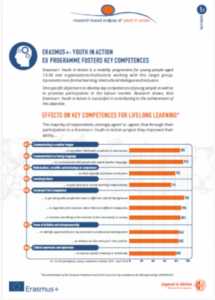 RAY shows, that the participation in a Erasmus+: Youth in Action project contributes to the development of various abilities related to the 8 Key Competences of Lifelong Learning. 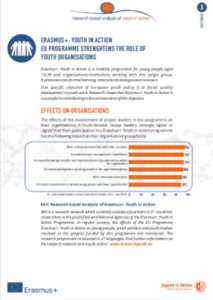 One specific objective of the Erasmus+: Youth in Action programme is to foster quality development in youth work. 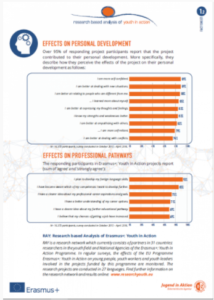 Research shows that Erasmus+: Youth in Action is successful in contributing to the achievement of this objective. 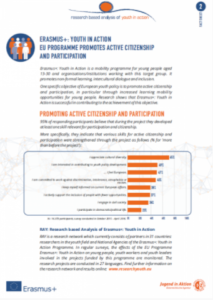 95% of responding participants believe that during the project they developed at least one skill relevant for participation and citizenship.